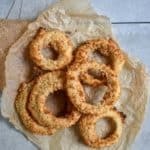 These Crunchy Baked Onion Rings are awesome! You only need 5-ingredients and about 30 minutes. They are golden brown, crunchy, healthy, and absolutely delicious. They’re also baked and not fried. 2 large yellow onion, sliced in rings about 1/4″. Line a baking pan with parchment paper or silicone baking mat. Add batter ingredients to bowl and mix until well combine and batter is smooth. In a separate bow, add “dry mix” and whisk to combine. Using a fork, dip raw onion ring into batter until entire onion is covered. Shake a few times and allow access to drain off. Transfer onion ring to bowl with breadcrumbs and coat evenly. Place onto baking pan and repeat until all onion rings are finished. Bake in oven for 25-30 minutes or until onion rings are golden brown and crunchy. Remove from oven and serve with favorite dipping sauce.